Home / cosmetic analysis / Liniments for baby : are they good for my kids ? Known to protect, cleanse and moisturize the sensitive skin of our babies, liniment has become a must for the toddler’s toilet. MyPack has examined more than thirty liniments distributed in France. You are shown the main good and bad practices observed at the manufacturers. Organic is growing! The pleasant conclusion of this evaluation was the number of manufacturers offering organic liniments, labelled Cosmebio Charter and Ecocert. Reassuring when we know that vegetable oils largely make up this product. We often find olive oil or sunflower to be associated with lime water, a mixture of water and calcium hydroxide. A majority of them favour beeswax as a binder and thickener to minimize the presence of synthetic components. However, the point of distribution is not a guarantee of the quality of the product. 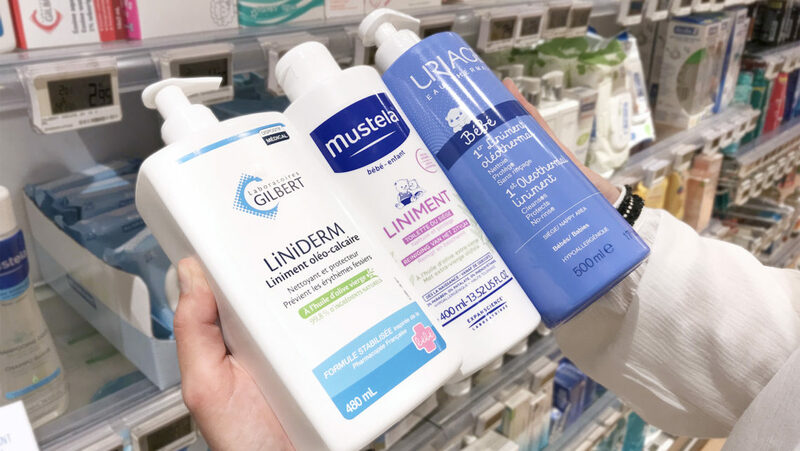 A bio liniment from the pharmacy may contain sensitive ingredients, and conversely there are brand name products without any sensitive components. Sodium Benzoate frequently used as a preservative. Synthetic and inexpensive, it is regularly accused of being irritating, especially for baby skins. Both organic and non-organic liniments can be made with Sodium Benzoate. Liniment is a product with a short period after opening (3 to 6 months on average). This PAO icon is too little to be visible and to known by consumers. The risk of using an out-dated liniment is real. With our MyPack app and visual packaging recognition technology, we enable consumers to identify products containing sensitive components. It is necessary to offer consumers easy-to-use information tools to buy and consume with conscience.